Adam Mercer and Abigail Walbridge are third year students at Cardiff Law School. Katie Mobbs graduated from Cardiff School of Law and Politics in 2014, and is now working for a local law firm on Court of Protection cases. Adam, Abi and Katie took part in a university research placement programme to help researchers at the Law School conduct research on a new Court. They write about their experiences here. ‘Welfare Cases in the Court of Protection’ is a research project at Cardiff School of Law and Politics, funded by the Nuffield foundation, examining the use of Court of Protection (CoP) by local authorities across England and Wales, and the impact of the Mental Capacity Act 2005 on them. We carried out this research under the supervision of Professor Phil Fennell and Dr Lucy Series through the Cardiff Undergraduate Research Opportunities Programme (CUROP). This blog outlines the background to the research project, its purpose of the research project, the questions we were hoping to answer, our methodology, and our preliminary results. It also records our experience as CUROP students. You can download the full report, will all the results of our research, on the project website. The CoP was established by the Mental Capacity Act 2005 to hear cases regarding a person’s mental capacity and their best interests. The Court has a number of powers: it can make declarations as to a person’s mental capacity, and the lawfulness of any act done, or yet to be done to them; it can make orders for a specific action to be taken in the person’s best interests. It can also authorise deprivation of liberty and make decisions about authorisations issued by local authorities under the Mental Capacity Act 2005 deprivation of liberty safeguards. An application to the CoP may be necessary for particularly difficult decisions, disagreements that cannot be resolved in any other way, or situations where ongoing decisions may need to be made about the personal welfare of a person who lacks capacity to make decisions about the matter in question. The project focuses on welfare cases between April 1st 2013 – March 31st 2014, which may include matters about where a person who lives, who they have contact with, any possible deprivation of liberty, medical treatment, welfare deputyship applications, and other welfare matters. It is not concerned with cases dealing with decisions about property and affairs. The case of Stephen Neary is a good example of why welfare disputes may need to go to the CoP. This case involved a disabled young adult who was sent to a residential home against his father’s wishes by the local authority (LA), without CoP proceedings being ordered; the issue was whether this was lawful. There was a complete communication breakdown between the child’s father and the LA. The case demonstrated the advantage the LAs have over the individual in terms of experience and resources. The ruling held that a LA has a positive obligation to bring a dispute like this to the CoP. There were a number of things we were hoping this research project would show us. The first is how cases actually get to the CoP, which would also show how effective the Neary ruling was in placing a positive obligation on LAs. The second is whether there are any regional variations in how often LAs go to the Court of Protection. 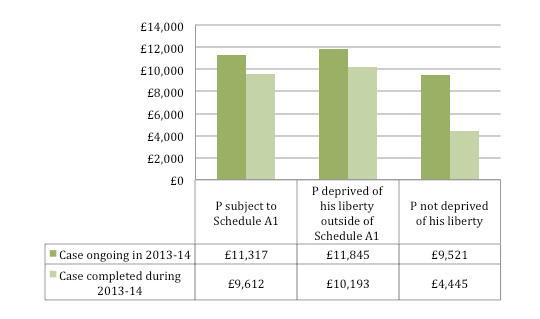 We also wanted to find out how much it costs these LAs to bring cases to the Court, and how all these factors may impact on access to justice for people who may have been deprived of their liberty. We used the Freedom of Information Act 2000 (FOIA) to request information from local authorities. 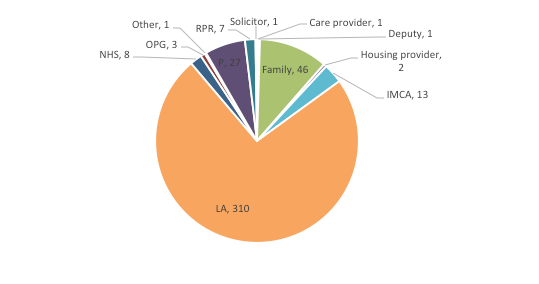 We helped Lucy and Phil to finalise the email to request information from LA’s, and we sent out all the requests for information to 185 LA’s in England and Wales, and the Welsh Health Boards, who were supervisory bodies under the Deprivation of Liberty Safeguards (DoLS). We put the responses into the spreadsheet, working carefully and methodically to avoid making mistakes while inputting the data. Some authorities relied on exemptions under the FOIA – for example s12, which is when answering requests would take officers over 18 hours of their time, or s40(2) when the supply of information would allow us to cross-reference this information with other information in the public domain to identify the individuals in particular cases. We sent authorities the Information Commissioner’s guidance on personal data as some may have been applying the test incorrectly. We sometimes had to politely chase up requests which were not answered. A more detailed breakdown of our results is contained in the report. 82% of LA’s responded with usable data by 1st August 2014. On average LA’s in England had been to the CoP three times throughout 2013-14, although LAs in Wales had been on average only once. However, a small number of local authorities in England had been a very large number of times: 20% had been more than five times, and 4% more than ten times. In Wales, no LA had been more than three times. We had found there was a very small correlation between the population size of the region covered by a LA and the number of times that LA had been to the CoP, which would suggest regional variations in the use of the CoP. Population differences could not explain different patterns of use in England and Wales. Half of all cases in our sample cost a LA £8,881 or more, but there were some very high cost cases up to £250,000. 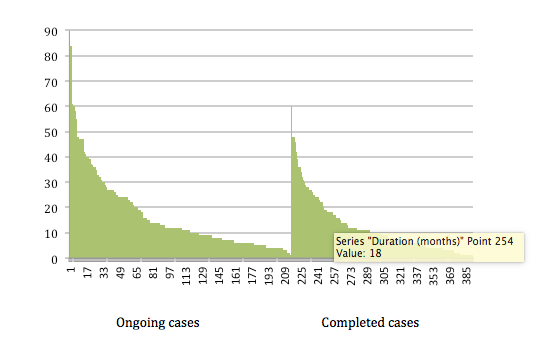 The average duration of the cases in our sample was 12 months. We would recommend anybody undertaking a research placement through the Cardiff Undergraduate Research Opportunities Programme, as it gives you a unique insight into academic research which you may not get elsewhere. We presented a poster with our research at a national conference in Manchester, and gave a talk at a conference in Cardiff. We have helped to write the report and an article about the research, which will be published in the Elder Law Journal. We would like to thank Phil and Lucy for allowing us to help them with their research, CUROP for providing us with a bursary for doing the research, and the public authorities for their co-operation and the time they’ve taken to provide us with the extremely valuable information they have given.